When one thinks of the Palace of Versailles, royalty and opulence often come to mind. Over time it has not only been the seat of power in France, but also the home to several of France’s Kings. However, “contemporary” is not a word traditionally associated with it – until perhaps now that a portion of it has been made over using DuPont Corian solid surface. Eleven rooms covering more than 7,500 sq. 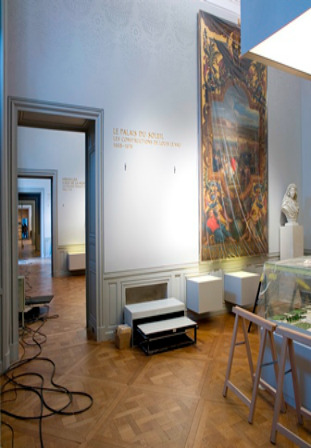 ft. were recently transformed into the new Palace of Versailles History Gallery, which focuses on the history of the palace from its beginnings in 1624 to its renovation by Louis-Philippe I, who founded the Museum of the History of France within Versailles in the 19th century. The design, which was developed by the Paris-based Projectiles Architectural Studio, is a unique blend of the classical and contemporary that mingles old-world style with cutting edge materials, technologies and techniques to create a stunning upgrade to this treasure of European art and history. Internationally renowned fabrication firm CREA Diffusion, based in Solgne, France, was hired to handle the fabrication and installation of the 16,000 sq. ft. of solid surfacing used in the venture. The project basically divided the rooms into three areas – the lower, middle and upper sections, each of which solid surface had a role in (see Lead-in Photo). For the lower section of the rooms, the original wall paneling that dates back to the 1800s was repainted and remains in place. However unique solid surface boxes are attached to the panels in a variety of sizes based on the area of the paneling to which they are assigned (see Figure 1). 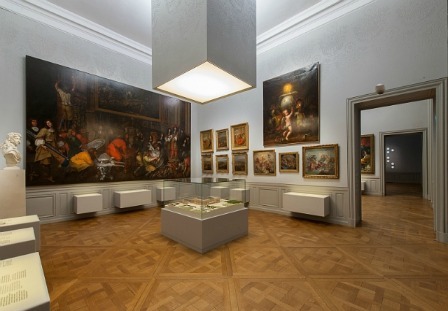 These boxes house lighting that both illuminate the paintings they are under and also backlight information inscribed in them about each of the exhibits. “All of the boxes are of different dimensions,” explained Thierry Delles, owner of CREA. “This gives an impression of volume and also prevents visitors from getting too close to the paintings. Figure 2 – All of the wall panels were engraved with different patterns corresponding to different historical periods based on what room they were in. The engraving began at the top of the wall and diminished in depth as it went lower. The main section of walls is now clad in 8-mm-thick (about 1/3-in.) 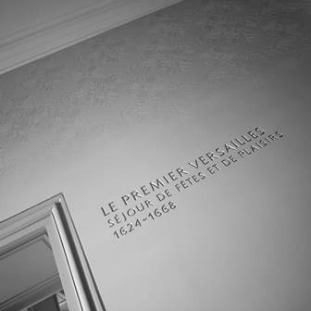 Pearl Grey Corian that was engraved with a different pattern for each room corresponding to a different historical period, which replaces the tapestries that used to cover the walls. The patterns have been slightly reinterpreted in order to create a sort of continuous wall painting, and a whole new style of engraving was created by the Change Is Good graphic studio just for this project. The engraving starts at the top and both the depth of the engravings and the width of them diminish as it moves down the walls (see Figure 2). And while the engraving technique affords precise splendor, it makes for a very slow process for the fabricator. 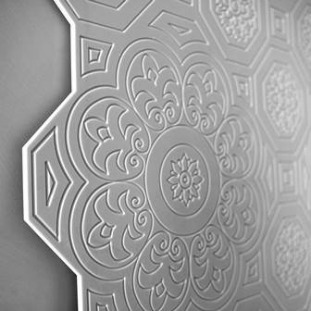 Figure 3 – Installing panels with such intricate and exact patterning without damaging the engraving was a bit of a challenge. CREA Diffusion overcame that by cutting the panels into sections with “puzzle-shaped” edges. Another challenge was to actually hang the 1- by 2-meter (about 3 ¼- by 6 ½-ft.) panels firmly on the walls once they were engraved and cut. Thankfully, CREA Diffusion has vast experience with exterior cladding, so came up with a solution by using a system of aluminum frames that were affixed to the palace walls (see Figure 4). 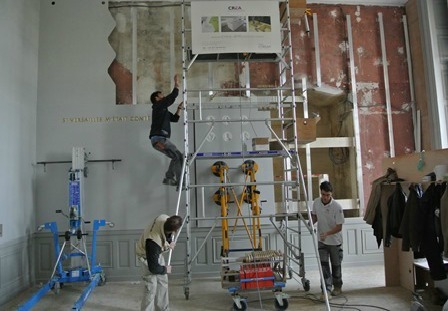 Figure 4 – A system of aluminum frames were affixed to the palace walls to hold the panels in place. After the solid surface panels were put in place and seamed together, the paintings and other displays are then affixed directly to them. One characteristic of solid surface that made it particularly suited for the application was the ability to invisibly repair holes in it when paintings were to be replaced or rearranged. That adds up to 45 hours of programming time and another 120 hours of machine time in total. And that doesn’t account for the time to sand and seam the engravings into the main panels or install them (see Figure 6). 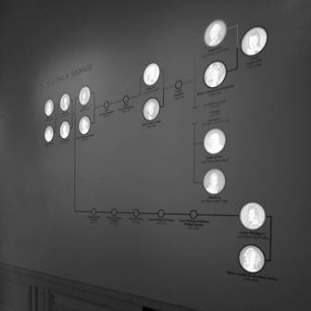 Figure 5 – One wall included an engraving of the family tree of the Burbons, which contained 15 portraits backlit to allow the faces of each to be seen in a sort of 3-D effect. The lights are of different sizes, based on the size of the room they are hanging in and the contents of that room, but on average weigh about 500 kg (about 1,100 lbs.) They are designed to allow more light to come from the top of the fixtures, roughly equivalent to daylight, while light flowing downward passes through a screen on the bottom softening it. Figure 6 – Creating the engraved family tree took 165 hours not counting sanding and installation time. All of the lighting is wired into a central digital control unit that can allow them to be brightened or dimmed manually. However, thanks to a series of photovoltaic cells discreetly integrated into the facade, the lights also automatically adapt to the natural light variations entering the rooms through large windows overlooking the garden, keeping a constant level of illumination. In June of 2012 the facility opened to the public, and millions are expected to visit in the years ahead. 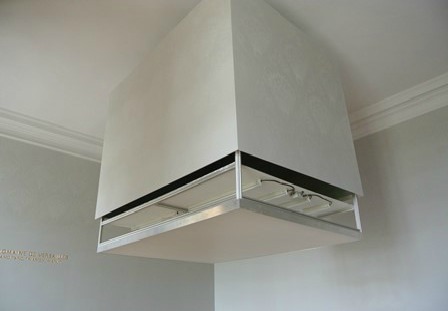 All-in-all, the entire project, not just the solid surface portion, cost 1.5 million euros (more than $1.9 million). In terms of just the solid surface work, 16,000 sq. ft. of solid surface was used, and it took 2,150 planning/study hours, 5,850 fabrication manpower hours and 4,200 installation manpower hours – an immense project for any fabricator (see Figure 8). Figure 8 – The immense project used 16,000 sq. 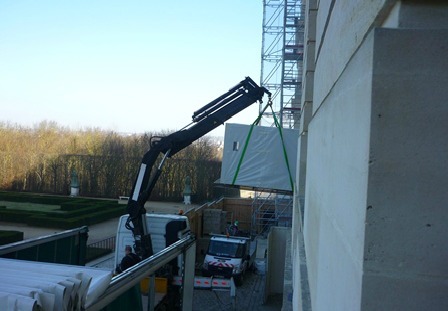 ft. of solid surface, which had to be hoisted into the building using a crane system. When completed, the solid surface portion of the project took more than 12,000 man hours. But time wasn’t the only time and effort that determined the immensity of this work; working in a place of such historical and cultural significance to the entire world also carried a lot of gravity. For more information, visit www.crea-diffusion.com.